Every holiday season as far as I can remember, the window displays at the San Francisco downtown Macy's department store draws a large crowd. Cute pets up for adoption by the SPCA, a non-profit animal welfare organization. Volunteers also stand by to collect donations from the public. 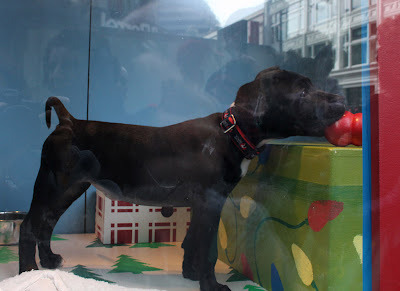 According to the SPCA website, $400,000 (305,000 Euros) have been collected in the last 7 years during the holiday window displays to find shelter for 2,300 homeless animals. As of last Saturday, 117 animals have found homes! You might even see the animals live on 4 different webcams if you watch during "window hours". On the top of my list for tomorrow - Visit all the windows! First time I have seen a dog that big in the Macy's window, how divine. It's good that they find homes for them. What a neat idea, so glad to see the animals are going to good homes. A wonderful fundraiser too. Great post! Have a wonderful weekend! Great idea, hopefully all the animals will find loving homes this Christmas! those animals (especially your second photo) look so adorable and cuddly. i'd gladly take them home. I'm glad that a lot of animals get adopted! Hope they all went to nice families who'll cherish them.